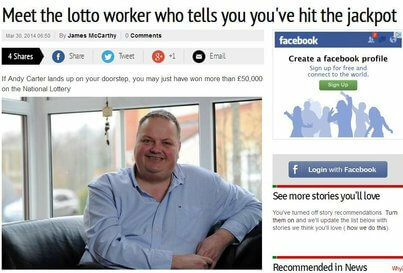 His must be one of the most satisfying jobs in the world; whenever you win more £50,000 on the National Lottery, Andy Carter comes to your door to make the official announcement. Andy is a senior wins adviser at Camelot, who spends most days traveling all over the country bearing news of big money wins to lucky lottery players. He is also the one who actually transfers the huge amounts of lottery winnings to players accounts. Andy says he must have seen all million pound winners in Wales over the last eight years. He shares that winners have different ways of dealing with their fortunes and that he has seen them all. Some husbands don’t tell their wives, and some wives don’t tell their husbands, parents who don’t tell their children. While it brings him pleasure to see joy in the winners’ faces, Andy’s job prohibits him from playing.